I wish there was a way of getting this text to let out a loud evil laugh, for honestly that I how I felt when I first got word that DLSI would in fact bestow the honour of allowing me to drive the MPVI. I am sure that I had a smirk plastered across my face on the days prior to the drive, for it is not everyday that we get to drive a specialized machine designed for the Defence forces; especially one that is designed to take on a mine blast! As excited as I was to just get behind the wheel and drive, I couldn’t let my emotions get the better of me and without further adieu, it was time to get down to work and decipher the MPVI. Mahindra Defence Systems (MDS), a Mahindra division, is one of the leaders in armouring light vehicles in India. The company has supplied over 1000 bullet proof vehicles to the Army, Paramilitary Forces and Central and State Police Departments. Furthering their prospects in the Defence Vehicle production segment is Defence Land Systems India (DLSI), which is a joint venture between Mahindra & Mahindra Ltd and BAE Systems, where Mahindra holds 74 per cent of the stake and BAE Systems retains 26 per cent. The company is set up to be a world class systems integrator in select land vehicles such as high mobility vehicles, Infantry and Combat vehicles, Artillery Systems as well as Mine Protected Vehicles. 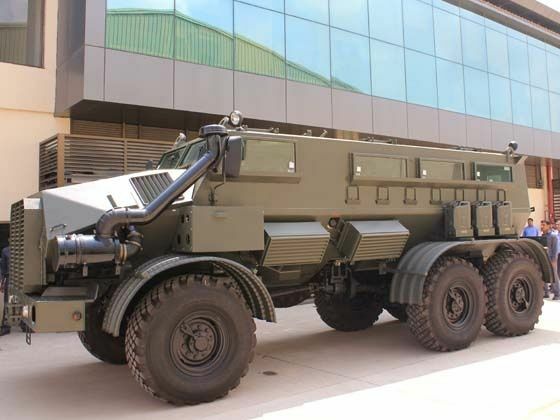 Incidentally the first vehicle to go into series production at DLSI is the Mine Protected Vehicle India (MPVI), which is based on the technology and product information transfer from BAE Systems OMC South Africa, which happens to be a world leader in this kind of vehicle technology. The Mine Protected Vehicle India (MPVI) is a large robust armoured machine that has been designed to do exactly what it has been named after; protect its occupants from a mine blast. To build such a specialized vehicle, Defence Land Systems India obviously had to source the best materials for the job. The main element in protection is the quality of the metal, and the MPVI needs a special high quality metal that is manufactured mainly in Sweden. The sheets are shipped in from Sweden and then cut to the predetermined specifications for the roof, sides and signature ‘V’ shaped hull. In order to weld the body together, DLSI has also employed a unique machine where the entire six ton body can be mounted and rotated so that it is easy for the welders to reach each and every spot and ensure maximum strength. Post the welding operations, the body shell is sent for shot blasting and then it is finally polished and painted. The completed body shell is then brought to the final assembly line where it is mounted to the chassis of the Ural truck, albeit after having to cut the chassis down to size. Ural is a Russian truck manufacturer that also has a facility in Bengal. Its rugged nature and quality build made it the perfect donor vehicle for the MPVI and the end result is nothing short of overwhelming. The MPVI means business and it is a prize piece of work from DLSI and it is virtually indestructible by a mine, however I did manage to get the fine folks at the factory to break into a sweat when I asked for the keys! In a true test of their faith in the Almighty, I was actually given the keys to the MPVI! Now, don’t get me wrong, they weren’t worried about the vehicle; their concern was for everything else-including buildings! After all, the MPVI is a 14 ton moving block of metal that could most probably drive through a brick wall. The good thing was, that we were out in a field and there was nothing I could destroy anywhere near us, plus this gave me a chance to drive without stressing out about obstacles. To get to the driver’s seat, I had to climb in from the rear, as there are no front doors on the vehicle, and make my way to the front and finally slide myself into the chair designed to commandeer this vehicle. Now, a driver of the MPVI has to undergo strict training in handling this vehicle as this is a rather special vehicle. After all, you are seated at a height where you feel as though you are on the first floor of a building, and adding to the task is the small split windshield and even smaller side windows that really don’t allow you to look around too much. Making judgment calls from that height can require a definite change in regular driving habits. I was going to relish my time behind the wheel of this monster truck so despite being a little nervous I slotted the truck into first gear and slowly got it moving. As I gained a little confidence I got it into second and finally into third. In third gear I was driving at about 40 kilometers per hour and that was as fast as I wished to take this behemoth, after all I didn’t want to push my luck. In terms of the mechanicals, the MPVI is surprisingly easy to drive. The 5 speed gear box does require a bit of muscle, but other than that the drive is great. A reasonably soft clutch, dual circuit full air over hydraulic brakes on all the wheels for great stopping power, and a nice large accelerator pedal do their business well and making it easy to maneuver the MPVI around is power steering. I managed to navigate the MPVI along a thin farm road as well as take a few turns where I had to avoid a ditch. With my co passenger and the large ORVMs assisting me on my judgment, I did manage to take the turn but it also made me realize that driving the MPVI in a crowded area would require a lot of practice. Powered by a V6 direct injection, intercooler, turbocharged diesel engine that churns out 230 Horse Power at just 2100 RPM and generates a maximum torque of 883Nm between 1100-1200 rpm, the MPVI is a monster truck. You feel the power from low down in the rev range, but don’t expect the MPVI to do burn outs. It’s essentially a vehicle designed to be powerful enough to handle convoy speeds up to 90 kilometers per hour with ease. The full time 6x6 drive further enhances its abilities for the MPVI is equally at home off the tarmac in desolate areas. In fact it even comes with a rear axle differential lock to assist in getting out of very sticky situations. Aiding its ‘go-anywhere’ nature are the large 425X85 R21 tyres that boast of run flat technology as well as feature a central tyre inflation system controllable by the driver. The large tyres also play a role in terms of ride comfort as well as they help soak in minor bumps and uneven roads. To deal with the rest, the MPVI uses the Ural’s leaf springs with cushion stop mountings and double shock absorbers up front and maintains the regular leaf spring set up at the rear, and the end result is a truck like ride quality, which isn’t really that bad and a lot of this has to do with the weight which helps keep things in perspective. With a GVW of 14020 kilograms, there is really nothing that is going to make the MPVI budge after all! For the occupants on board, this spells a decent ride that won’t jolt their bones, which is comforting for the only other creature comfort that they get is air conditioning. Driving the MPVI is only a minor part of this vehicle’s actual role, after all it has been designed to suit a single purpose and that is to withstand a blast from a mine, so while I was happy playing GI Joe behind the wheel, the real purpose was explained to me by the various DLSI technicians. Offering the highest protection possible for a mine protected vehicle in India, the MPVI can withstand a blast of more than STANAG 4, which is the official ballistic rating on this vehicle. This basically translates to the fact that the MPVI can easily withstand a blast of more than 20 kilograms of TNT. The exact rating is kept secret; after all, it could be used by the enemy as vital information. While on the topic of ballistic protection, the MPVI’s opaque armour has been tested against 6 rounds of 7.62x51mm NATO FMJ Ball Round, 7.62x39 mm AK Ball Round and 5.56x45mm INSAS Ball Round (with a minimum spacing of 51mm between two rounds). The sides and front of the vehicle were tested from a distance of 10 meters at 90 degrees towards the surfaces. The roof was tested upon from a distance of 10 meters and 45 degrees to the surface. The transparent armour on the MPVI has been tested against 3 rounds of 7.62x51mm NATO FMJ Ball Round, 7.62x39 mm AK Ball Round and 5.56x45mm INSAS Ball Round (minimum of 120 mm between two rounds and minimum of 80mm for plate edges). All transparent surfaces were tested from a distance of 10 meters and 90 degrees to the surface. Apart from withstanding a literal fury of firepower, the MPVI also offers the occupants 16 firing ports to fight back from within the safety and confines of the vehicle. The MPVI has been tested exhaustively in the field and has also been sent to testing facilities abroad as India currently doesn’t have the full capability to test certain parameters of such a vehicle. Some of the major tests include rigging the MPVI up with 3 anti tank mines and then blasting them, as well as major tests on the repercussions of a blast on the passengers. Using mannequins that are fitted with sensors, testing is conducted to calculate G-Forces on various body parts. After all, keeping the occupants safe is the main purpose of this vehicle and even if the shell survives a blast, the shock waves and the fact that the vehicle gets tossed around can result in broken bones and in some cases death. All these aspects have been tested and the MPVI has proved to be more than suitable. Essentially, the tyres, axle and parts of the drivetrain do suffer major damage after a blast and the vehicle isn’t fit to drive, but the occupants are cocooned in a thick metal shield and the fact that their lives are spared is what really matters and the MPVI more or less guarantees this. In a real life fighting situation, the MPVI becomes a virtual fort for those inside after a mine blast and they can continue fighting from the various ports provided on the body until a rescue team arrives. The MPVI has been designed to cover all the bases and thanks to its powerful engine, enhanced protection, go anywhere mobility, and mine blast protection; it is the ideal vehicle to take on anti terrorist and anti-naxal operations. I on the other hand had just been having a blast driving this behemoth around but it did have a humbling effect on me as well. Once my adrenaline rush gave way to sane thought, I realized that more than just withstanding a mine blast of taking on some major firepower, this vehicle saves lives, saves families and saves a thousand dreams. It’s a sobering effect that makes me respect the Jharkhand Police Department even more as they have to deal with death on a daily basis while taking on the naxals in the area and its vehicles like this that keep them alive. Kudos to DLSI as well as it is great to see a private manufacturer taking the lead and bringing in world class products to counter terrorism threats and protect the lives of our various lines of defence.